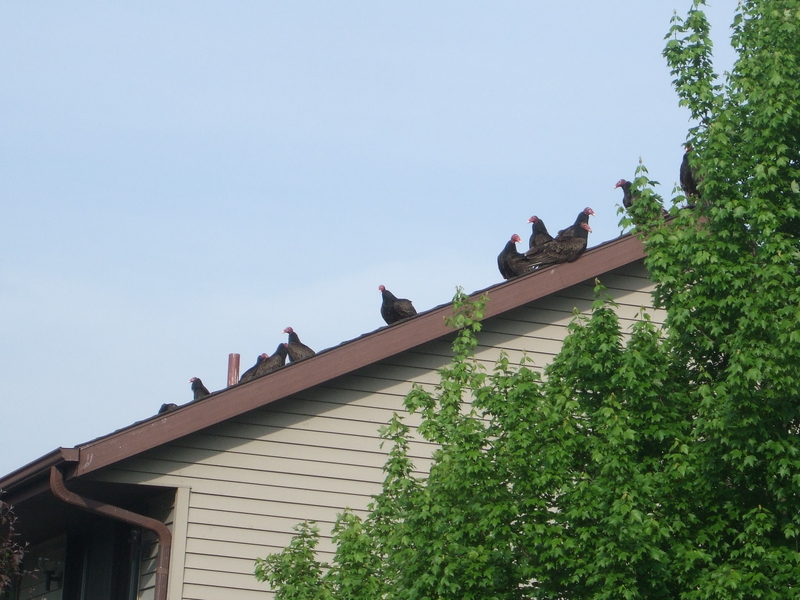 Vultures on the neighbor’s roof. After a long winter, we went to the lake cottage to open it up for the summer season. The wildlife had taken over. Vultures had splatted white droppings over all the outside railings and most of the deck. I scrubbed with soapy water and a powerful hose, but the stuff sticks like paint. A robin made her nest over the front door. We dislodged it slightly when we opened the door. When the robin came back, she tipped the nest onto the porch and spilled out four naked babies. My husband was sick about it and asked Miss Outdoors Woman (me) to rescue the birds. Only two of the baby birds were still breathing, but I put all four back into the nest, just in case I was wrong. Maybe that was a mistake. I wedged the nest back on the ledge and put the front door off limits. The dutiful mother returned with food for her babies. Later, however, the nest was down again. I found only three birds. The fourth had disappeared. I buried the two which were clearly dead. I put the survivor into the nest and moved it nearby to a more stable position. The mother returned with a worm in her beak again and again. The nest was one foot away, yet she could not see, hear, or sense her baby. Bird brain! I worried about that baby all night and figured he’d be dead by morning. At midnight I awoke because my husband was making a commotion downstairs. A bat had swooped too close to his nose while he slept in front of the TV. He opened the backdoor and ducked, waving a towel at the bat and afraid of being dive bombed. Outdoors Woman to the rescue! I followed the eight-inch bat upstairs and isolated him in a bedroom. I opened all the windows and used a screen to guide the bat outside — or tried to. He got into the bathroom, hit the mirror, and fell into the sink. With my husband yelling instructions to me from outside the bedroom door, I coaxed the bat out of the sink using the screen. Eventually, the little guy found the open window and flew into the night. In the morning I got my shovel and brought the bird nest to the garden for burial. At the last minute I noticed the baby bird was still breathing. I don’t hold out much hope for his mom to return, but that was his only chance. I duct taped the nest into its original place above the door and left him to his fate. We’ll go back to the lake house next weekend to check on our animal kingdom. Can anyone tell me the proper way to replace a nest and the baby birds? So sad.